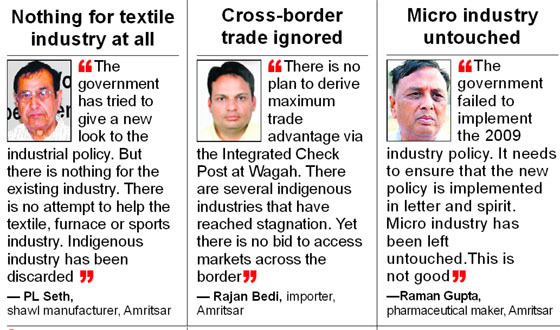 While underlining the need to “ease regulatory control” in its new industrial policy, the Punjab Government has accepted that the single-window system introduced in the 2009 policy has failed to deliver, mainly on account of bureaucratic hurdles. Punjab Congress Legislature Party (CLP) Leader Sunil Jakhar today claimed the state government was resorting to crony capitalism by announcing tax rebates for big industrial houses which were close to the SAD-BJP Government. After a series of electoral defeats, the Congress leadership in the state had become frustrated to the extent that it had started creating hurdles in the state's development, said the ruling Shiromani Akali Dal today. The industrial policy launched yesterday was debated at a Cabinet meeting over incentives to be given to border areas with Food and Civil Supplies Minister Adesh Partap Singh Kairon and Revenue Minister Bikram Singh Majithia differing over areas to be given these sops. Sand may soon be available through open warehouses that too at half the market price. The government has decided to dig up river-beds for providing sand to consumers at controlled rates. Even as the stage is set for the 29th anniversary of Operation Bluestar on June 6, the memorial built in memory of those killed in the Army operation remains mired in controversy. While there is enthusiasm in the Damdami Taksal camp, the SGPC is treading with caution. After two years, a 156-member SGPC jatha will leave for Pakistan on June 8 to observe the martyrdom day of Guru Arjan Dev on June 12, as per the amended Nanakshahi calendar. The Sant Longowal Institute of Engineering and Technology (SLIET), Longowal, which was closed on May 10 till the second week of June after a large number of students on the institute’s campus went on a rampage on May 6, will remain shut for students up to June 30. It has been stated that the closure could be extended if so required. The functioning of 1,186 health and 582 veterinary dispensaries falling under Zila Parishads throughout the state, has come to a virtual standstill, with the rural pharmacists and class IV employees working in these dispensaries boycotting work since June 1 following non-regularisation of their services despite seven years of service. Stone crushers in Punjab, complying with environmental norms, will be functioning again. The district administration has started cleaning and repair of drains and nullahs in and around the city with a total budget of Rs 3.75 crore. The Punjab and Haryana High Court has refused to postpone Punjab State Teachers Eligibility Test on the request of candidates, who preferred to remain behind bars in protest against non-regularisation of their services as teachers, instead of taking the examination after applying for bail. Under the new industrial policy, Deputy CM Sukhbir Badal has announced that clearance from the departments concerned and the final go-ahead would not take more than 40 days. The Industries Department portal (pbindustries.gov.in) at the moment has no online provision for submission of documents or a gateway for handling payments. The new policy focuses on expediting clearances for new projects and expansion of existing ones by providing for a single-point, time-bound clearance system. There will be just one composite application form (CAF) for common clearance from various departments/agencies. There will be time-bound industrial clearances for change in land use; approval of layout plan; approval of building plan; sanction of water and sewerage connectivity; requisition, sanction and release of power connection, consent of establishment (NOC) and authorisation of storage and transportation and disposal. Hurdles in work related to Excise and Taxation, PSPCL, Punjab Pollution Control Board, Housing and Urban development and Urban Local Bodies will be removed. 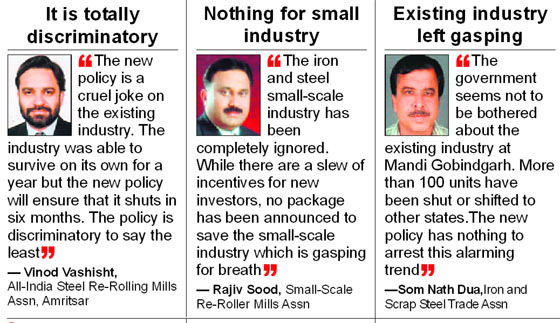 The policy allows self-certification to industrialists. This means individuals will be allowed to go in for third-party certification from private architects, structural engineers and environmentalists. This will save time and spare investors from harassment. The self-certification by a third party (experts in the various fields) will have its own checks and balances. The buildings will be under scrutiny and invite penal action in case of any aberrations. The policy will ensure online payment gateway for direct payment. In a statement, Jakhar asked why no initiative was taken to revive the existing units to make them viable. He said Mandi Gobindgarh had already turned into a ghost town due to government apathy. Jakhar also asked how tax rebate could be announced beyond the period for which the SAD-BJP has the mandate to govern. He said this was a serious issue which called for a special session of the Punjab assembly for a debate. “What is the guarantee that the existing industrial units will not be re-christened and avail tax benefit without really industrialising Punjab or adding any gainful employment,” he asked. Meanwhile, former Deputy Chairman of the State Planning Board RR Bhardwaj said the government had announced an industrial policy without making any provision of land. He said an agency had been deputed to create a land pool which itself could take years. He said it was strange that new industrialists who wanted capital and interest subsidy were being offered tax rebates with retrospective effect once they got into production. “It is akin to giving money to someone when he does not need it”, Bhardwaj observed. 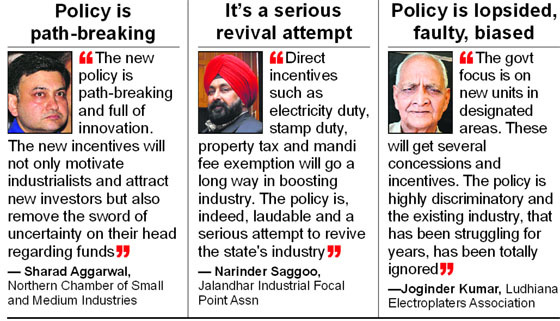 Sangrur MP Vijay Inder Singla said the state industry was looking for solutions to the unjust electricity duty as well as advance power security taken from them but were disappointed. Singla said if the state government was really concerned about the existing industry in Punjab, which had remained loyal to Punjab despite concessions given in the neighbouring states, it should cover it under the VAT and CST concessions announced for those setting up new units in the state. The MP said Industry Minister Anil Joshi had been humiliated at the launch ceremony of the new industry policy by not even being asked to speak. “Instead of appreciating the forward looking industrial policy announced by the SAD-BJP Government, the Congress leadership is spreading negativism to harm the state's interests,” said Daljeet Singh Cheema, SAD spokesman. "The Congress must tell the people as to what its respective governments at the Centre and the state have done for the development of the state during the past 60 years,” he said. Cheema said though there were a number of ministers from Punjab in the Central Cabinet, they had failed to bring a single development project to the state during the past nine years. “All ministers at the Centre contribute to development of their states but ministers from Punjab have a blank record in this regard,” Cheema said. He said whatever Punjab had achieved so far was because of the hard work of its people. “Being a border state, Punjab had to face several difficulties to pursue development but successive Congress-led Central Governments not once came forward to help the state,” he claimed. “Now that Punjab has taken a major initiative to develop its industrial sector on its own by using its resources, the Congress leadership is trying to create a scare among investors by resorting to a negative propaganda,” said Cheema. 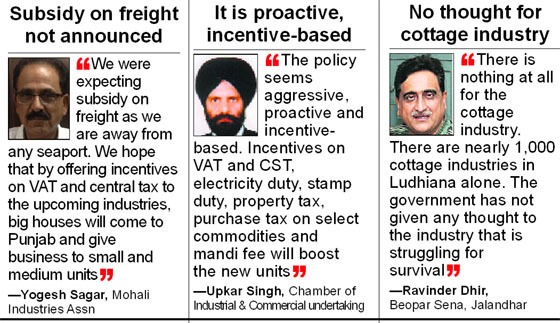 The industrial policy launched yesterday was debated at a Cabinet meeting over incentives to be given to border areas with Food and Civil Supplies Minister Adesh Partap Singh Kairon and Revenue Minister Bikram Singh Majithia differing over areas to be given these sops. As a result, the meeting, which was expected to end within 30 minutes, dragged on for over three hours and even delayed the launch of the new policy by more than an hour. Sources said when sops for agro and food processing zones were being discussed, Adesh Partap recommended that concessions, including exemption from marketing fee, rural development fund and infrastructure fund besides VAT and CST rebate, be given to border blocks and not the entire border district. This, he said, would encourage development of border blocks as the industry was at present centered around Amritsar and adjoining areas like Batala. The move would have also helped in the development of the Patti constituency held by the minister. However, Majithia argued that concessions should be given to the border districts and not blocks as this norm was followed by the Central Government too. He said giving concessions to border blocks alone would narrow down the choice available to investors. 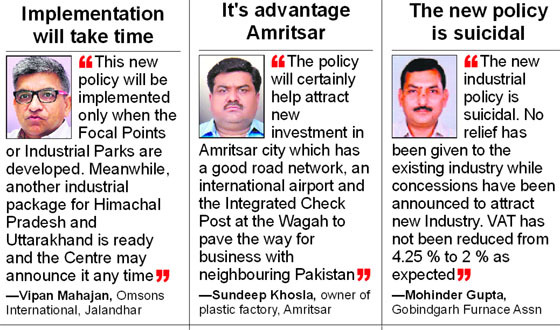 There was also a perception that investors were mainly based in Amritsar and that they should be given the choice to invest. Industry Minister Anil Joshi supported Majithia’s contention following which it was decided that the concessions on food processing units should be applicable to border districts. Another proposal put forward by Adesh Partap was that IT industries be allowed to use 50 per cent of their land for IT purposes, 40 per cent for housing and 10 per cent for commercial use. But the Revenue Minister contended that this clause, if permitted, could be misused by IT companies and put them in competition with real estate companies. A few other ministers were of the same opinion and it was decided not to go for the proposal. Finance Minister Parminder Dhindsa was of the view that registry fee should not be waived. But he agreed to the concession in the larger interest of industrialisation. The SAD-BJP Government has been drawing flak because of the exorbitant price of sand. There are also allegations that a sand mafia is functioning in the state. To counter this and to ensure that the issue does not become a poll plank in the Lok Sabha elections, the government has decided to set up sand warehouses. Deputy Chief Minister Sukhbir Singh Badal held a meeting of Deputy Commissioners from across the state yesterday. The officers have been asked to take up the task on a priority basis. The government is keen to roll out the project within the next fortnight. Sources said it had been decided that river-beds, particularly the central areas, should be excavated. Punjab has 260 km of river-beds. Since minerals and mines are a state subject, the state can go ahead with the excavation. The exercise will also help check silting in rivers which leads to flooding of embankments. An exercise conducted by the government revealed that many mining sites still remain unidentified. There is a feeling that a section of district officers as well as mining officers prefer it this way. These officers have now been asked to report all unmarked mining sites in their areas. It has also been decided to create new blocks of five hectares each. Around 200 to 300 new blocks are likely to be formed. Sand from such blocks will be carted to designated warehouses from where it will be distributed to consumers. The present rate of sand is around Rs 1,500 to Rs 1,700 per 100 cubic feet. The aim is to bring down the price to around Rs 800 per 100 cubic feet. The rate per trolley is expected to come down from around Rs 9,000 to around Rs 4,500. The annual revenue from sand mining was Rs 54 crore during 2002-07 under the Congress rule when 527 quarries were being exploited. It jumped to Rs 154 crore during 2007-12 under the SAD-BJP rule when only half of the total quarries were being excavated. Sources said the revenue was likely to cross Rs 400 crore. Meanwhile, the government has also allowed farmers to identify and mine their own quarries in areas where sand is available in fields. Farmers can apply for permission from respective subdivision magistrates (SDMs) and excavate sand up to a level of 6 feet. The move also aims at increasing the availability of sand in the state. The construction work on the memorial was started on June 6 last year. The Damdami Taksal, which was entrusted with its “kar sewa”, built the memorial in less than 11 months and dedicated it to the community on April 27. However, its opening sparked as much controversy as the start of its construction work. The reason being the Damdami Taksal’s move to inscribe the name of Jarnail Singh Bhindranwale at various points in and around the memorial. The SGPC and the Taksal are at loggerheads over the issue. Akal Takht chief, Giani Gurbachan Singh is now brokering peace between the two sides. The SGPC took some measures to undo what the Taksal had done. It turned around the “golak” kept inside the memorial on which Bhindranwale’s name was inscribed and removed a wall clock with his photograph. However, there are five more sites where his name is engraved- two marble plaques atop the memorial entrance, two aluminum plaques on either side of the staircase and another mentioning the history of Operation Bluestar. Damdami Taksal chief Baba Harnam Singh Khalsa said the controversy was unfortunate. He accused political parties for it. He said non-Sikh organisations should not interfere in the matter as it was purely a Sikh issue. Supporting the move to name the memorial after Bhindranwale, he said the Akal Takht had bestowed the title of “martyr” on Bhindranwale on behalf of the community. Avtar Singh Makkar ,SGPC president, refused to comment on the issue. He said the anniversary would be observed as usual. 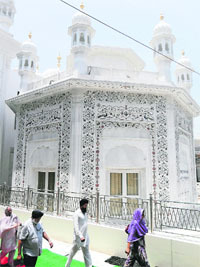 “An akhand path is being held at Akal Takht. The bhog ceremony will take place at 8.30 am on June 6 and a message will be read out by the Akal Takht chief. The Damdami Taksal is holding a special programme at its headquarters at Chowk Mehta here where an “akhand path” will be held at Gurdwara Guru Darshan Parkash. Sources said the Taksal was putting in extra effort in holding the programme to mark the occasion as it intended to exhibit its strength and unique identity. A large number of people from the country and abroad are expected to participate in the Taksal’s programme at Chowk Mehta. Meanwhile, the city police has been put on alert ahead of the occasion. Avtar Singh Makkar, SGPC president, said they had applied for 192 visas, but the Cente and the Pakistan High Commission had refused visa to 36 persons. He said the entire Sikh community should observe the martyrdom day on June 12 as per the amended calendar which had been approved by Akal Takht. He said the Pakistan Government should not play with the sentiments of the Sikh community at the behest of PSGPC chief Sham Singh. He said those who had submitted their passports could collect the same from the SGPC office on June 7. The decision was taken at a meeting of the institute director with deans of various faculties and heads of department. The meeting was convened by the director to review the prevailing situation and the pace of ongoing work, started to restore normal functioning on the campus of the institute. Meanwhile, the SLIET authorities have cancelled 40 days’ summer vacation of the faculty members to get repair work done in the laboratories and restore their functioning as early as possible. There are about 180 faculty members (assistant professors, associate professors and professors) who will not be able to avail the summer vacation this year. The acting registrar of SLIET Dr AS Dhaliwal confirmed that the authorities had further closed the institute till June 30 for students, to complete the ongoing repair work in a speedy manner. Dhaliwal said the summer vacation of faculty members, slated for June 6-July 15, had been cancelled to get the institute going at the earliest. He added that the authorities had issued tenders for starting 14 hostel mess in the institute. He said the examinations of the students, which had been deferred earlier, could be conducted any time after June 30, while the SLIET Entrance Test (SET)-2013 would be held on July 14. The institute has sent 1,700 students of certificate, diploma and degree courses on six-week industrial training to various industries across the country, he said. The training would start from June 6 and end on July 17, he added. Out of 1,186 health dispensaries, almost 200 dispensaries have been locked since June 1, with posts of rural medical officers (RMOs) being vacant and pharmacists and Class IV employees boycotting work. Similarly, around 120 veterinary dispensaries out of 582 are locked. These pharmacists and Class IV employees have been working in these dispensaries since 2007 on contractual basis, but the government has not formed a concrete policy for their regularisation. In 2007, these pharmacists were directly appointed under rural medical officers. They were paid salaries as per the rural medical officer’s discretion. Their pay was then fixed at Rs 5,000 and they were later brought under the Zila Parishad. They started getting a salary of Rs 7,000. Following a Supreme Court order, while the Punjab government regularised all rural medical officers in 2011, the pharmacists and Class IV employees were assured that they would also be regularised soon, but since then, the government has been extending their contract every six months. Despite handling most of the work in these dispensaries, they are being made to work on a meagre salary of Rs 7,000. Rural pharmacists and Class IV employees are now up in arms against the Punjab government and have threatened to continue the boycott till their demands are met. Demanding a pay scale on a par with their counterparts working in the health department, state convener of the Rural Pharmacists Action Committee and member of the United Front Punjab Ram Singh said, "We want a pay scale of Rs 10,300-34,800-4,200, which means our initial pay with all allowances should be Rs 30,290, but so far, the government has not done anything. Similar is the case with Class IV employees working with us, who were paid Rs 3,000 instead of at least Rs 15,000." Gurmeet Singh from Ludhiana said, "The government now says it would appoint pharmacists based on merit, but how can it ignore our service?" “We did our pharmacy course almost 10 years back when there were hardly three-four colleges in the region that offered these courses and merit was not that high. With the entry of private sector, students these days have started scoring more marks as these colleges are busy making money and award high percentages so that more and more students take admission there. How can we equal their merit?” he said. "Moreover, we have been working for the last seven years already and are certainly more experienced. Ignoring us at this stage is unethical," he added. The Punjab Government has told the Punjab and Haryana High Court that a proposal to modify the policy guidelines for registration and working of stone crushers in the state was sent for approval “and has been considered by the Cabinet”. The state counsel told the Bench of Justice Rajive Bhalla and Justice Rekha Mittal that “after the receipt of decision, the relevant regulations shall be notified within 15 days”. The development is significant as the cost of construction material had gone up with the closure of the crushers. Punjab Minister for Rural Development and Panchayats Surjit Singh Rakhra and Patiala Deputy Commissioner GK Singh inspected the spots including Jacob drain, Chhoti Nadi, Sirhind choe, and siphons near Patiala and instructed officials to complete repair and cleaning work before June 30 to avoid flooding. He said to make room for an emergency, another Rs 2 crore has been set aside. Behind bars for damaging public property, teachers protesting against their non-absorption as permanent employees wanted the High Court to defer the holding of State Teachers Eligibility Test. Frowning on their attitude, the vacation Bench of Justice Tejinder Singh Dhindsa has turned down their plea. 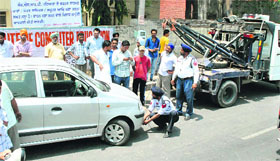 Dismissing the petition filed by Harpinder Kaur and other petitioners against the Punjab Government and other respondents, Justice Dhindsa asserted: “On a pointed query having been put to the counsel as to why the petitioners had not availed of any remedy that may be available to them in the nature of having filed an application seeking bail, the response forthcoming is to the effect that the petitioners are protesting. “As such, they would rather prefer to remain in custody. Such attitude on behalf of the petitioners can certainly not be appreciated, who are on the other hand invoking the extraordinary writ jurisdiction of this court. There can possibly be no basis for postponing the State Level Teachers Eligibility Test in the light of the stand taken by the petitioners”. In their petition filed before Justice Dhindsa, the petitioners had earlier asserted that they were working as “special trainer resources” since 2011. They possessed the qualifications of ETT and B.Ed, but the government has not been considering their demand for permanent absorption. The petitioners added they had been representing individually and at “the union level”. 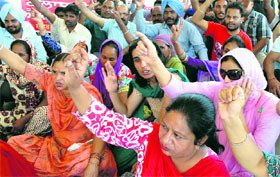 They added on April 29, they and “other similarly situated employees” had protested in front of Bathinda mini secretariat; and were taken into custody. An FIR dated April 29 under Sections 283, 160, 188, and 149 of the Indian Penal Code and Section 3 of the Prevention of Damage to Public Property Act, 1984, was been lodged at the Civil Lines police station, Bathinda. They added directions be issued to the respondents to postpone the test scheduled for June 9, “on account of the fact that the petitioners are in judicial custody”.